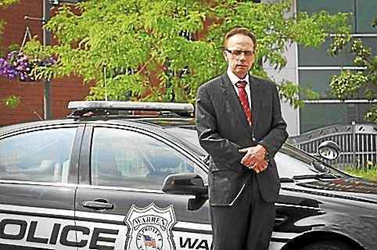 For the third consecutive year, Warren Mayor Jim Fouts will participate in a ride-along with a Warren police officers to monitor the streets of Warren for fireworks violations. Mayor Jim Fouts said a special task has been formed consisting of police, property maintenance inspectors, CERT (a police volunteer group), fire department personnel, and park employees, all of whom will be patrolling neighborhoods July 4. This year, for the second year, police undercover officers will also be on the lookout for fireworks ordinance violators. Police patrols will be specifically assigned to fireworks enforcement. Fouts said penalties are a $500 fine or 90 days in jail, and city parks will be closed, and school properties where fireworks are prohibited will be checked regularly. On July 1st, Mayor Fouts rode with the Warren Police and visited eight locations where fireworks are sold. All eight were in compliance with both state and city laws and licensing. The Mayor also distributed handouts reminding citizens of important safety rules for the 4th of July, including and most importantly, prohibitions regarding persons under the influence and violations involving minors. The other message was to educate on where fireworks cannot be discharged: city parks, school property, within 30 feet of homes and buildings, easements–including the ITC corridor, and city streets. On June 26, 2015 under the direction of the Mayor, the Warren Police Department conducted a decoy operation, sending a minor into 31 fireworks sales locations to purchase fireworks. All 31 asked for identification and refused to sell fireworks to the minor. The uniformed Patrol Division also has a nightly fireworks enforcement detail where checks are made throughout the city. They have also found no licensing or sales violations. Several tickets have been issued for illegal discharge of fireworks and the Mayor has ordered a zero tolerance policy by the Warren Police Department. The Citizens Emergency Response Team (CERT) will also be activated during the July 4th holiday to assist uniformed patrol officers with enforcement. This entry was posted in Safety Initiatives. Bookmark the permalink.